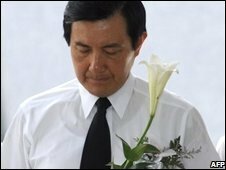 Taiwanese President Ma Ying-jeou has apologised for the killing and imprisonment of tens of thousands of dissidents in the 1950s and 60s. During the so-called "white terror" period, martial law was imposed by members of Mr Ma's Kuomintang party, after they fled to the island in 1949. The president told victims and their families he hoped there would never again be a similar tragedy in Taiwan. Mr Ma has apologised before, but this is his first time as president. He made the public acknowledgement at a privately organised ceremony commemorating the 21st anniversary of the lifting of martial law in Taiwan. During the white terror era, thousands of people, mainly from the intellectual and social elite, were arrested, tortured and jailed on false charges of treason or espionage. Others simply disappeared after being taken away by government intelligence agents. Local papers reported that as Mr Ma spoke, one tearful woman in the crowd interrupted him, shouting out that her parents had been wrongfully arrested and convicted, and that her family life had been ruined. She later told reporters that the Kuomintang should offer compensation. The incident underlines continuing sensitivities and political divisions over Taiwan's recent history, when the Kuomintang ruled the island for decades with an iron grip, after fleeing there at the end of the Chinese civil war. Many believe the party has still not fully atoned for its past actions.